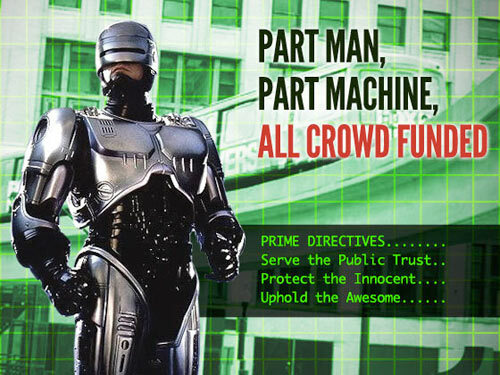 Earlier this year, over 2,700 people ponied up cash through the online crowd-funding platform Kickstarter to erect a statue of the 1980s icon RoboCop in Detroit, Michigan. Plenty has been said—both good and bad—about this quest to “uphold the awesome,” whether the statue will be a good or bad thing for the city struggling to regain a solid footing. Curbed Detroit recently checked in with Brandon Walley of Detroit Needs RoboCop and learned the statue could be ready to install as early as the summer of 2012. While a site for the statue must still be secured, organizers are currently awaiting the original RoboCop model to be shipped from Hollywood before the statue can be dipped in bronze. Considering that the 1987 American sci-fi action film was literally set in a near-future (you could say present-day) Detroit, and given the themes of resurrection, memories, and conflicted policies with logical fallacies, the statue likely holds more than just a nugget of nostalgia to the supporters.